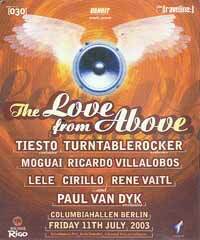 For the fourth consecutive year, about four thousand clubbers attended The Love From Above, a pre-Love Parade bash at Berlin’s famous Columbiahallen. This year’s lineup featured Tiesto, Turntablerocker, Ricardo Villalobos, Rene Vaitl, Lele, Moguai and of course, Paul van Dyk. For those who have never been to Columbiahallen, the venue is actually two halls straddling a courtyard. The larger main hall on the right is called Columbiahalle and the smaller “house music” hall on the left is Columbiafritz. The courtyard offers ample seating under the stars and a number of vending stands peddling anything from t-shirts to beer. As if the courtyard was not enough of a chill out area, there are smaller courtyards as well as an upstairs seating area inside the halls. For such a great setup, we spent almost the entirety of the night in the main hall. As luck would have it, it was rainy and cold the night of the party. Weather aside, we probably would have stayed inside Colubia regardless. The music was damn good. By the time we made it inside, Moguai was tearing it up with a funky, if somewhat commercialistic set that relied on a few anthems to get the crowd in the mood. 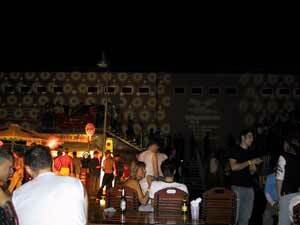 The place was starting to fill up with revelers trying to escape the cold outside. After clubbing in a smoke-free NYC for quite a while now, it took a bit of adjusting to the cloud of cigarette smoke in the air. Initially, I though it was leftovers from the smoke machine hanging over the crowd! After Moguai got the crowd moving, Tiesto took over and took my mind off of the smoke completely. I was actually very eager to see Tiesto. While I had seen him a bunch of times in the States, the only time I didn’t hear him spin cheese was at the Winter Music Conference in Miami last year. After talking to many Europeans who couldn’t believe that their beloved Tiesto could be as terrible as I described, I started to suspect that he was one of those DJ’s who underestimates American tastes and dumbs down his sets around here. Seeing him spin a dark, hard set at the WMC only supported my suspicion. I didn’t think he had it in him. At The Love From Above, I needed to see if the WMC was a fluke. Turns out, Tiesto really IS good. His track selection would make a lactose-intolerant smile. Much like in Miami, he spun a hard set that visibly lifted the energy level at the club several notches higher from the first few tracks and kept eveyone’s feet from touching the ground until PvD took the tables. As soon as Paul showed up in the booth, everyone went nuts. I didn’t think the crowd could get any more into it after Tiesto. Paul kicked it up a notch with a set that was also much harder than what he usually spins in the U.S. outside of the WMC. Columbia’s floor became magnetized, drawing what seemed like every partier from the outside courtyard and even Fritz. I wouldn’t even be surprised if the other hall had tumbleweeds rolling around in it because it seemed like everyone was rolling around in the main hall. One can almost tell if the music gets better without hearing a sound. When the crowd gets into it, they dance more. The more they dance, the hotter the temperature. Soon after Paul dropped a couple of tracks, it seemed as if the temperature went up by about ten degrees. He was good. Very good. Not the best set I’d heard him spin, but right up there. By the looks on everyone else’s faces, I take it just about everyone else in the place approved.